With its ancient palaces and stately gardens, the Lahore of Pakistan's 1947 independence was a haven and a muse for musicians, artists, and poets. The city came alive to the beat of a tabla drum; with a musical culture passed down over centuries and a thriving film industry, opportunities were great for the legion of musicians that called Lahore home. Today, this vision of Lahore exists only in myth. Islamization, ethnic divisions, war and corruption have torn apart the cultural fabric of Pakistan, and the sounds of the tabla no longer drift through the old city's bazaar. In 2004, Izzat Majeed founded Sachal Studios to create a space for traditional music in a nation that had rejected its musical roots. After convincing a number of master musicians to pick up their instruments again, they quietly released some classical and folk albums. But it is an experimental album fusing jazz and South Asian instruments that brings Sachal Studios worldwide acclaim. Their rendition of Dave Brubeck's Take Five becomes a sensation, and Wynton Marsalis invites them to New York to perform with the Jazz at Lincoln Center Orchestra. After a groundbreaking week of rehearsals fusing the orchestras from Lahore and New York, the musicians take to the stage for a remarkable concert. Despite their rising international acclaim, Sachal Studios remains virtually unknown in Pakistan. The ensemble is faced with a daunting task; to reclaim and reinvigorate an art that has lost its space in Pakistan’s narrowing cultural sphere. "You haven't heard Dave Brubeck's jazz classic Take Five until you've heard it played by Pakistan's Sachal Jazz Ensemble, complete with sitar and tabla." 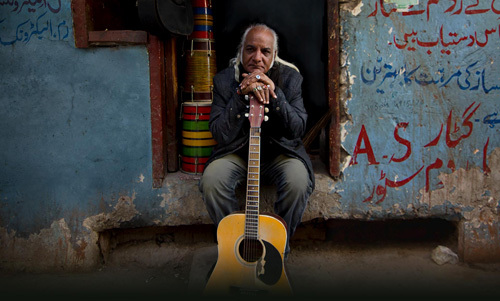 "Like Buena Vista Social Club set to the beat of traditional Pakistani music, Song of Lahore is a feel-good exploration of making music as an act of defiance and the unifying property of love of the arts." "And the moment when we hear a sitar move seamlessly from an Eastern melody into the opening notes of Dave Brubeck’s Take Five is one of pure symphonic bliss." "Song of Lahore is a documentary that shows a side of Pakistan that is seldom seen, even by its own residents. For a country that has grown to believe that art is sinful, it’s refreshing to see the still-active group of people who thrive on art to express themselves and who use it as a ways to embrace their own spirituality and celebrate their religion—something that militant Islamists do via violence." "The energy and freedom of Manhattan liberate the visitors but it’s during the rehearsals for the concert that the real charm of the film takes hold."